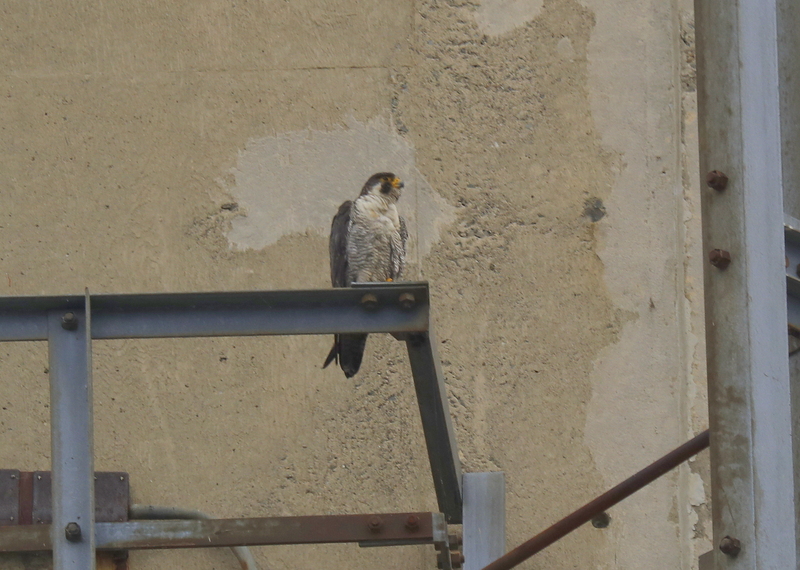 The Lawrence Peregrines continue to be seen in a variety of perch locations over last few weeks. Both adults and at least two of the 2016 hatch year fledglings have been seen on the Verizon Cell Tower on Hampshire St. This has typically been a cold weather perch location so it was a bit of a surprise to find the falcons here! Peregrine Falcon: Woburn fledgling up close! in well hidden perch on nearby utility pole cross beams. This young peregrine fledged 3 weeks ago yesterday! Click “next” in upper right to advance frames! In the hot and humid weather, the fledglings have taken to the shadier perch locations around the Clock Tower. In the morning, under the blazing sun, they tend to favor ovations on the west side of the building. On many days, it provides a cooler perch and on many days this side provides exposure to SW winds. Peregrine Falcon: Woburn – food transfer! 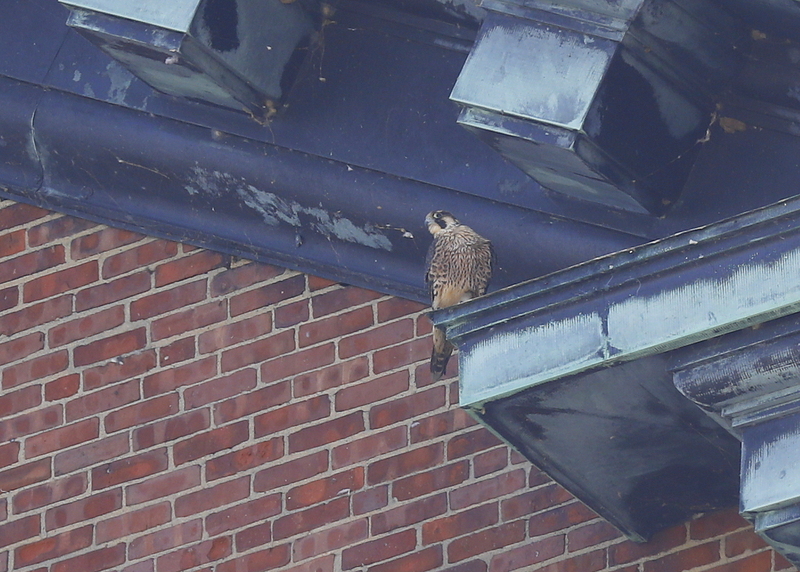 Another early morning visit yesterday with John Harrison to watch the peregrine falcons in Woburn. Upon arrival the adult male was perched to the east of the nest ledge, and at a bit of a higher elevation. Around 6:30 AM, the female and fledgling came streaking in from the east. The female had prey in her talons and was likely making a food transfer. After lots of noise, commotion, and a few aerial chase loops, the female landed on a regular perch to the west of the nest ledge with a mourning dove in its tight grasp. The delivery of food to young falcons changes after they fledge. Research by Steve Sherrod suggests 5 types of general food transfers. These range from perched transfers to aerial transfers to dead drops and even live drops! The fledgling spread its wings, mantled the pray for a bit, and then began eating. It finished with the legs and feet going down the hatch! Click “next” in upper right to advance frames…. Had a nice visit to Woburn Peregrines in the early evening. The sun had ducked behind the quarry walls and the dark shadows of late day set in. Scanned all over looking for one of the peregrines. 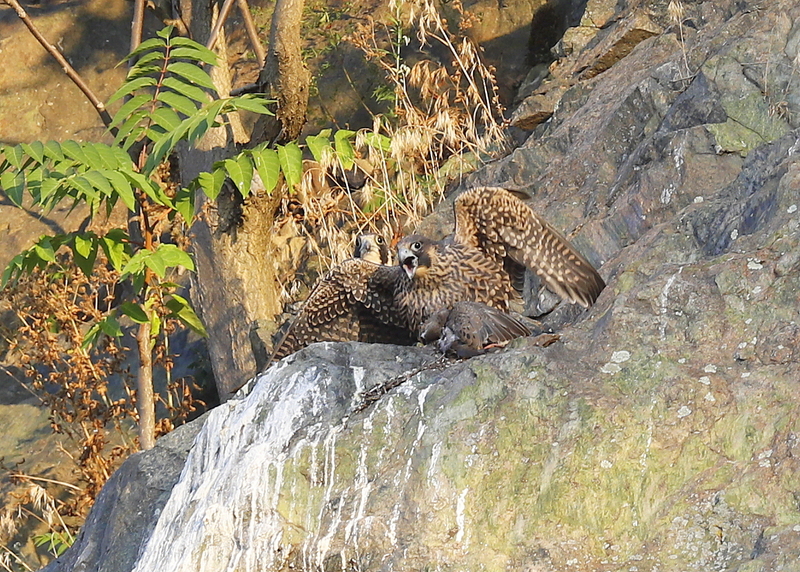 was fortunate enough to locate the young hatch year fledgling at the very top of the rock wall. It was nestled in among vegetation and remained in place for over 20 minutes. 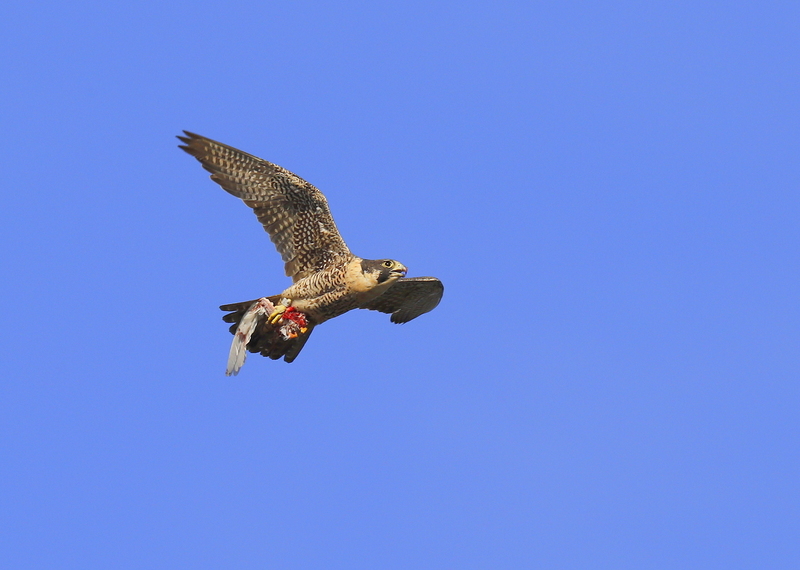 Peregrine Falcon: Woburn – in flight with prey! What a beautiful morning with bright sunny skies and temp almost 60 degrees just before 7AM. Met up with John Harrison and his friend, Jeff Meshach. Jeff serves as director for the World Bird Sanctuary outside of St. Louis, MO. We were able to observe the two adults around the quarry area. We had great looks at the female as she lugged prey in flight passing by us and landing on an upper rocky outcropping to enjoy her morning meal! The fledgling bolted from its high elevation rocky perch after the encounter with the Great Egret. It flew at high speed and then landed on one of the nearby utility wires. It struggled a bit to maintain balance. 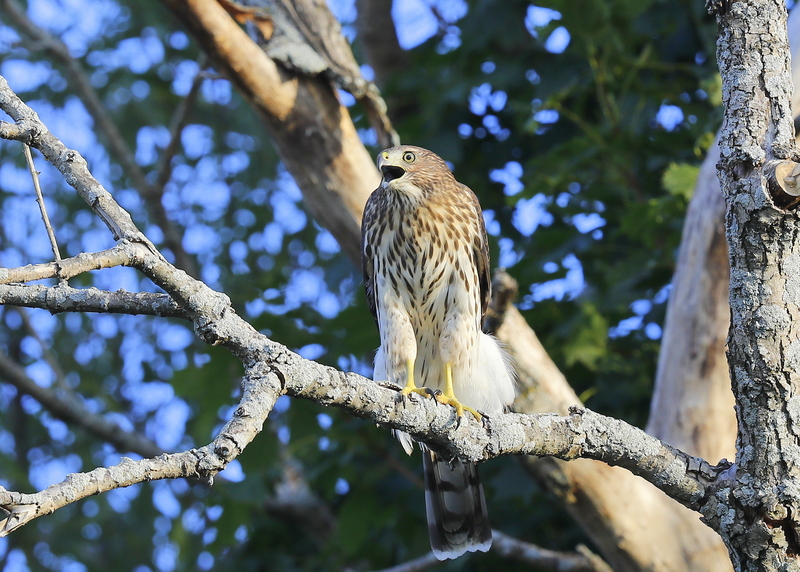 The peregrine fledgling had discovered a juvenile Cooper’s Hawk in a tree. Young peregrines may protest loudly with the “cacking” type of vocalization. 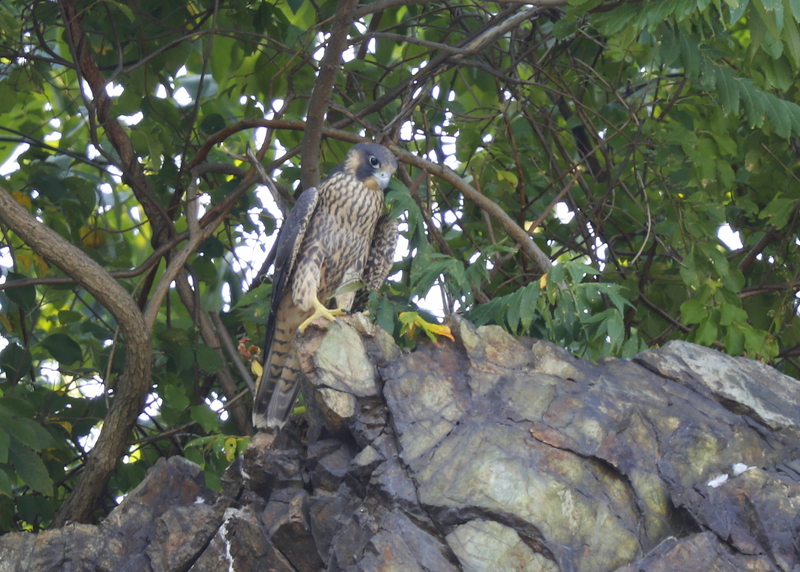 According to peregrine fledgling expert, Steve Sherrod, young peregrines appear to have a genetically programmed or instinctive recognition of other birds of prey as potential threats. Through their own experimenting and encounters, the fledglings learn which predators to avoid, which to attack, and which to ignore. They vocalized at each other and then both flew off! Click “next” in upper right corner to advance frames…. 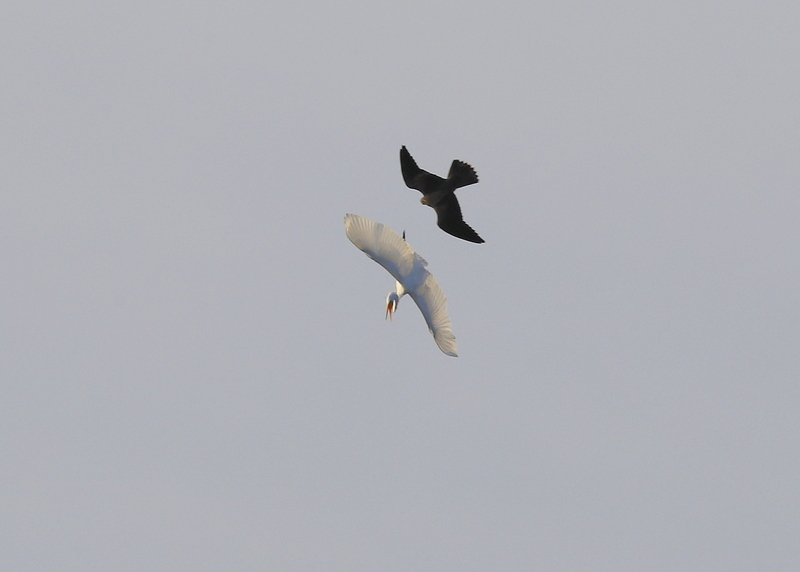 Peregrine Falcon fledgling in pursuit of Great Egret! 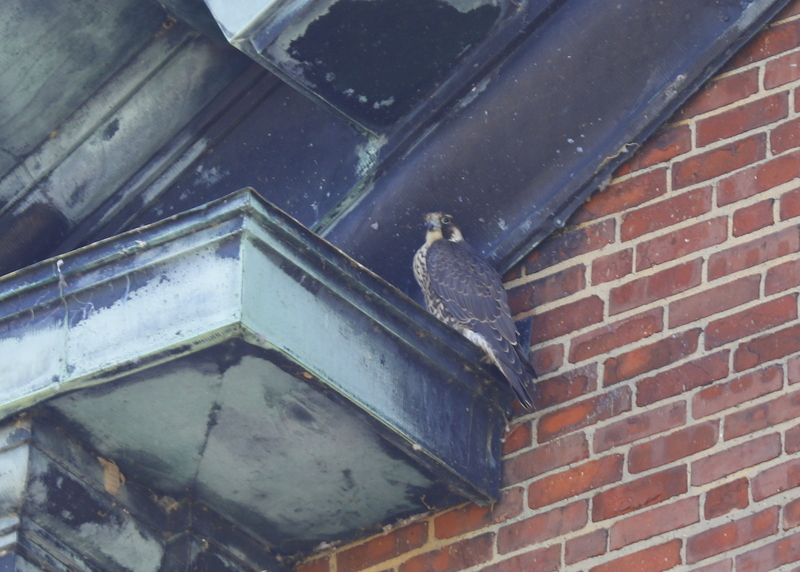 Under bright sunny skies, stopped by to observe the peregrine falcon fledgling in Woburn early this morning. The fledgling was perched on one of the highest ledges. It then flew 30 feet away to another ledge perch. A few minutes later it lifted off and shot forward like a rocket. It had spotted a potential target and it took off in a straight line with hard, fast wingbeats. It approached a group of three passing Great Egrets from behind and slightly lower. This placed the falcon in the blind spot of the Egrets. The Egrets proceeded to make evasive moves and the fledgling made repeated stoops and dives along with a few grasping attempts. The fledgling then circled at a wider perimeter and then returned in a direct face-off with one of the Great Egrets. The Egret can be seen sending out a vocal protest. The fledgling gave up and returned to an elevated rocky perch! Click “next” n upper right to advance frames! Stopped by the Clock Tower late afternoon and scanned for peregrine falcons. 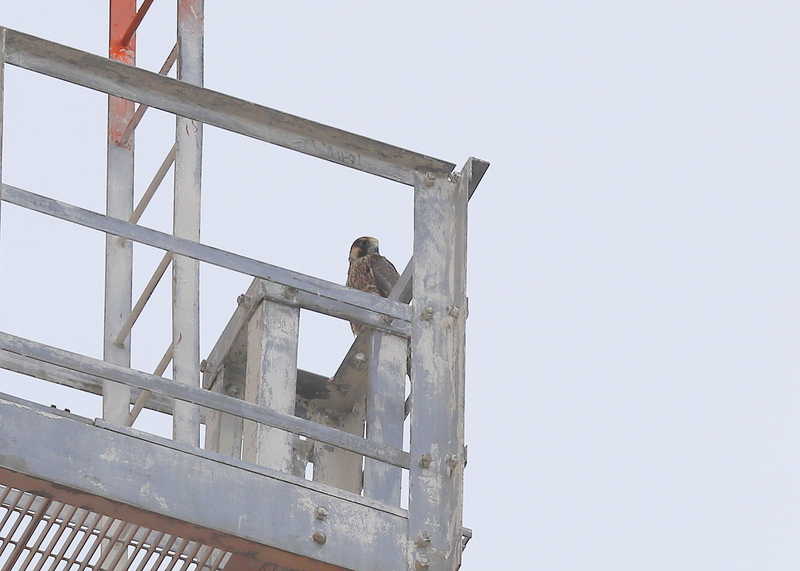 After scanning for over 15 minutes, finally made a sighting of a distant peregrine perched on the Verizon Cell Tower located about 1/2 mile away in NW direction. After getting closer, was able to get good enough looks to determine it was on the of the 2016 hatch year fledglings! One of the 2016 hatch year fledglings continues to be seen in and around the Clock Tower. This morning, under bright sunny skies, a fledgling was seen in one of the normal adult perch locations, on a ledge, just above the west face of the Clock Tower. It remained in place for over 20 minutes in an upright posture with both feet down and wings held tight against the body.